The forty-five years that Steve Earle has spent roaming this Earth have not been easy. However, after running afoul of the law in 1994, Earle cleaned up his act and began to make up for lost time. He just released Transcendental Blues, his fifth album in as many years, and though it follows the same genre-jumping flight path as his 1997 release El Corazon, the new album is far more cohesive, carrying a gracefully thematic storyline. Earle's songs have always conveyed a maturity level that was beyond his years, but as he's aged he's learned the finer, more subtle points to making a record. Since founding his own label, he seems freed from major label intrusion, and he and Ray Kennedy, his partner in the Twangtrust, have become one of the best production teams working today. Their relationship gelled quickly, yielding Lucinda Williams' Car Wheels on a Gravel Road as well as several excellent albums by Earle. Transcendental Blues continues this trend, and in fact, its ups the ante for the duo's future projects. All things aside — to make a great album, you still need a solid foundation upon which to work. Fortunately, Earle has been extremely consistent here as well. From his acoustic songwriting-focused effort Train A Comin' to the bluegrass excursion The Mountain, Earle has shown he has a true knowledge and understanding of Americana roots music, and he draws upon this quite extensively throughout Transcendental Blues. He recently taught a course at Chicago's Old Town School of Folk Music and utilized Harry Smith's celebrated anthology as his text book and guide. Clearly, he also used this as his muse in creating Transcendental Blues. Earle's songs are timeless as they majestically dance their way through folk, blues, and bluegrass styles, while emoting his pain and anguish with resolute conviction. Lonelier Than This is as sparse and heartfelt as country-folk can get, while on The Galway Girl, the demarcation between Celtic folk and American bluegrass is blurred, blended, and whirled. Yet, this is just one part of the equation. The experimentation begun on El Corazon comes to fruition on Transcendental Blues. Though Earle's songs still firmly embrace traditional Americana music, he's begun to move in a myriad of new directions, combing his record collection for sounds and incorporating them into his compositions. He reportedly kept a copy of The Beatles' Revolver on his monitor throughout the recording process, and the psychedelic edges of the Fab Four dripped, seeped, and oozed their way deep into the fertile earth of Earle's songs. The title track carries with it hints of Eastern spiritualism amidst its bed of crunchy guitar chords and fuzzy synthesizer, and the string arrangement that augments the fable of The Boy Who Never Cried seems to fortell its grievous conclusion. Likewise, Earle backward- loops a snippet from the chorus of Everyone's in Love with You to offer a brief Beatle-esque reprise to the song. Another Town gleefully pulsates over its Traveling Wilbury's groove, and All of My Life rages with garage-rock intensity as Earle purges himself of his demons. 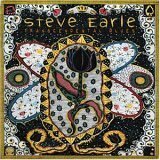 The result is a perfect blend of rock, outlaw country, blues, pop, folk, psychedelia, and bluegrass that serves as the fitting framework for Earle's deeply personal lyrics. Throughout Transcendental Blues, he reflects on his life, ponders the paths he has taken, and comes to grips with his mistakes. He desperately clutches at the last embers of love on the tearful I Don't Want to Lose You Yet, leans on his sister Stacey for support during his darkest hour on the gorgeous When I Fall, and ruminates about his broken promises on the exquisite bluegrass cut Until the Day I Die. It's true that heartache and sadness pervade Transcendental Blues, but there is also a sense of relief that shines through the darkness. It's as if by acknowledging his troubles, Earle can finally transcend them — and hence the title. Throughout his career, Earle has been showered with Grammy Award nominations — Best Male Vocal Performance (Country) and Country Song of the Year for Guitar Town; Best Contemporary Folk Album for Train a Comin'; Best Male Vocal Performance (Country) for Exit O; Best Contemporary Folk Album for El Corazon; and Best Bluegrass Album for The Mountain. In other words, Earle is long overdue to win, and if there's any justice, Transcendental Blues will finally afford him that long-deserved opportunity. Transcendental Blues is available from Barnes & Noble.